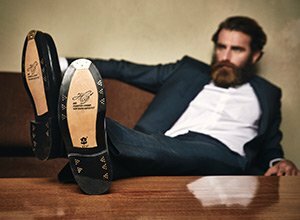 Gentlemen can be recognized by all of their accessories, not just their footwear. 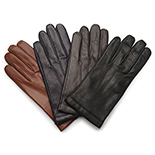 Our handcrafted, tasteful leather gloves for men thrill with premium materials and a timeless, elegant look. 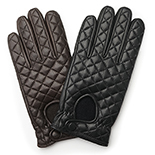 Whether you select a smooth leather, velours, or suede pair, our meticulously processed gloves are sure to lend a stylish accent to your cold-weather accoutrements. Stylish kid leather gloves with Merino wool cuff, snap button closure and cashmere lining. 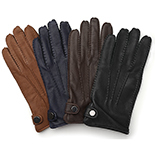 Classic deerskin gloves with decorative seams, snap button closure & cashmere lining. 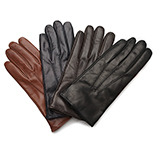 Fine leather gloves for men are an essential accessory for the autumn and winter—it does not make sense to wear a coat without them. As regards selecting suitable gloves, the same general rules apply as when selecting suitable men’s belts or men’s socks ; namely, one needs to separate the wheat from the chaff. Unlike misshapen mittens or reversible models, sophisticated men’s gloves are distinguished by soft leather, a meticulously crafted fit, and quality lining. 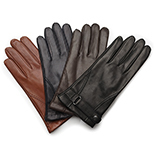 Our collection of classic leather gloves for men combines stylish design with premium materials. Leather men’s gloves enjoy a long tradition, the roots of which stretch back to the earliest days of mankind. In prehistoric times our predecessors created makeshift gloves by wrapping furs and skins around their hands and feet, which served as protection against inclement weather conditions. In Ancient Egypt and Classical Greece, gloves were not only worn during work, but were also donned by high dignitaries to indicate power, status and wealth. For example, archaeologists discovered 27 pairs of leather gloves in the grave of Tutankhamen. Among early advanced civilizations, it was customary to wear leather gloves at mealtimes to protect fingers from hot dishes—forks and knives were still largely unknown at this time. Incidentally, this practice continued until the High Middle Ages. During that era, wearing gloves was still exclusively reserved for men—it was not until later that noble women also began to wear leather gloves. Again a little later, leather gloves took on a further symbolic value: a glove thrown down before an opponent’s feet was an invitation to a duel, while the glove itself was also a love token handed from a maiden to her beloved knight. While over the course of the centuries the form, materials and length of gloves were subjected to the vagaries of fashion, leather gloves in particular established themselves as firm favourites among men and women alike. As if that were not enough: until 1800, gentlemen were expected to change their gloves several times a day in order to suit each situation in which they found themselves. As late as the early 20th century, glove colour, (costly) materials, and number of daily changes alerted the attentive observer to the social status of the glove-wearer in question. The advent of the cold, wet time of year marks the beginning of the glove-wearing season. At this time, gentlemen distinguish themselves not only through their winter footwear, but also through tasteful winter accessories, such as classic men’s leather gloves. That being said, not all leather gloves are created equal. Only gloves that are made from premium leather and submitted to careful processing are able to transcend practical hand warming to become exquisite accessories with high aesthetic appeal. 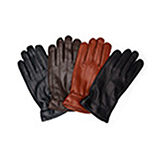 When it comes to types of high-quality leather gloves, kid leather enjoys worldwide popularity. Its flexibility, durability and comfortably soft feel make this type of leather perfect for producing fine leather goods. 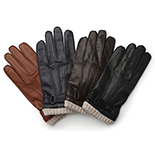 As a result, kid leather gloves are a crucial component of our collection of fine leather gloves for men. Fans of the exotic will enjoy our supple peccary or deerskin gloves—stylish yet dependable accessories for the autumn and winter. Some of our models feature cuddly, soft lining made from the finest cashmere, while others boast cuddly rabbit fur, which promises total comfort at frosty sub-zero temperatures. While gloves, particularly men’s models, may be subject to less stringent style etiquette today than in days of yore, they should nevertheless harmonize with one’s outerwear and footwear. As is the case with Oxford and Derby shoes, classic kid leather gloves in black are recommended as a starting point. 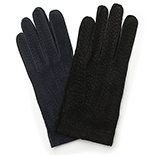 Black gloves are advantageous: they match coats and suits, and are also excellent paired with jeans. Their brown counterparts, on the other hand, are better combined with beige, brown or blue fabrics—along with matching shoes, naturally. Ideally, leather men’s gloves should adorn hands as brogues adorn the feet.